Was Michael really a good son to God? The first Archangel created by God was Michael. 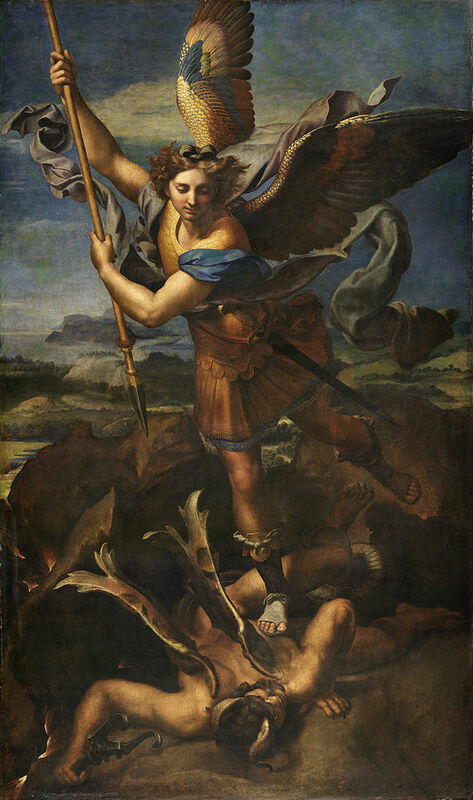 Michael is one of the four archangels, with the other three being Lucifer, Raphael and Gabriel. Before the Earth came into existence and long before the universe existed as well, Michael, Lucifer and the others fought alongside God to defeat the Darkness. Eventually, the Darkness was cast away with the help of the Mark. Sometime after the Darkness was defeated, Michael became the older brother to Lucifer. He watched over him, raising him and protecting him. Michael is quoted as saying that he took care of Lucifer in, "a way that most people could never understand". It seems as though of all the siblings, Michael and Lucifer were the closest and happiest together. Living in Heaven with God brought them even closer together. When the Leviathans were locked away to Purgatory, and when Heaven was created along with Earth and humanity, God told all of the other beings in the universe to respect and honor humanity. God wanted them to love humans more than himself. Michael was quick to follow these commands; however, Lucifer was suspicious of this. Lucifer saw humanity as flawed and damaged goods. He went to Michael for help, but Michael did not attempt to help him. This lead to Lucifer being cast out of Heaven. And when Lucifer created demons he was cast into a cage by Michael, under God's orders. Michael also went on to become commander of all the angels, and served to run Heaven and Earth for centuries and centuries. Eventually Lucifer's demons schemed up a plan to free Lucifer from his imprisonment. The seals binding Lucifer became broken. Michael, along with the angels Raphael and Zachariah, wished to bring the Apocalypse into fruition in order to allow Michael to fight Lucifer. When Michael would defeat Lucifer, paradise on Earth would finally be allowed to come to life. Some of Heaven's angels opposed this plan, but they did not have a chance to speak against it. When observing whether Michael is a good son to God, we must fully examine who Michael is. He is quite complicated, to say the least, with a multi-faceted personality. He has a strict code of ethics that go well with his strengths. He effectively and strategically established the rules and conducts of Heaven, including harsh retaliation for breaking the rules. Some have even called him, corrupt. This could further be exemplified in the fact that Michael did not keep everyone around him fully informed on various proceedings, for example when God departed Heaven. When it comes to God, Michael is very obedient and does not question his father's wishes. Serving God is the single most important thing to Michael. This is further shown by Michael's love for God despite not seeing him for thousands of years' time. His love and faith for God are unquestionable at this point in time. Michael seems to not have a sense of free will, and his complete trust lies in God. But, like his love for his father, Michael also loves Lucifer. The truth is, as expressed by Michael to Dean, is that he never wishes to slay Lucifer. The issue is that God's orders override Michaels love. Michael's love is expressed in multitudes throughout the show. He considers ending their quarrels many, many times. Lucifer also maddens Michael greatly; he is to blame for all of Michael's problems. To Michael, Lucifer ruined everything that was once good and loving. Lucifer ultimately betrayed everyone (as Michael sees it). Michael isn't an angry, tyrannous individual though, he also is a loving and understanding angel. Do not forget that both Uriel and Zachariah were forgiven by Michael. Michael seems to have a mean spirited side when anyone comes close to interrupting his life's goals and path. 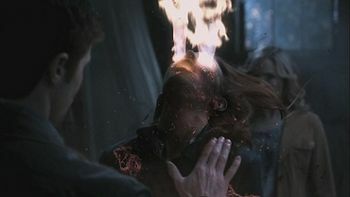 This is exemplified with the interaction between him and Dean at the Stull Cemetery. Michael does not kill Dean in this scene though, so again his forgiving nature is shown as well. Michael kills Anna for interfering with his plans. Michael's nature is complex, but seems to be ruled by egoism tendencies, rage, and struggles of power. He loves God, loves his duties, and will stop at basically nothing to fulfill them. In this sense he is being a good son to God, but he doesn't have much of a choice. Looking at Michael's opinions on the human race, he appears to not care a good deal about them. He kills them without worrying about how many or how often. For example, in order to speak with Zachariah, he kills a bar full of people just to do so. Michael's actions against humans do not stem from hatred, as is evident in that he doesn't kill them for recreation. He doesn't mind that God loves humans more than his angels. This is a great difference between Lucifer and Michael. Michael went so far as to bow to God when asked. It remains to be seen whether Michael even tortured Lucifer. Personally, I don't believe Michael did, as this does not fit in with who Michael is and what he thinks about his brother. His story is slightly depressing, even going so far to say quite tragic. He is betrayed or left by almost everyone he holds dear. His main mission is to prove himself worthy to God, his father. Although he doesn't ever get to accomplish this, it is his main priority. Michael's general love for Lucifer and the rest of his brothers, combined with his indifferences and general non hatred for humanity, make him a good natured individual. His obedience and commitment to serve God and remain a good son, with or without free will, prove that Michael is truly a good son. His devotion to carry out God's plans prove that he is a good son. The fact that the Apocalypse occurred as a result of Michael's obedience does not negate this fact. Both Lucifer and Michael play the villain numerous times. This is a topic that is freely open to debate, and one must review all the facts. It is subjective. However, personally Michael serves God, and Lucifer is more of a free thinker. So it can easily be noted that Michael is in less control of his actions and therefore, not at fault as much as Lucifer for any transgressions.